THE Office of the Ombudsman has reversed its 2016 resolution that found Mayor Oscar Moreno liable for graft in connection with a tax settlement agreement between city hall and Ajinomoto Philippines Corp. in 2014. 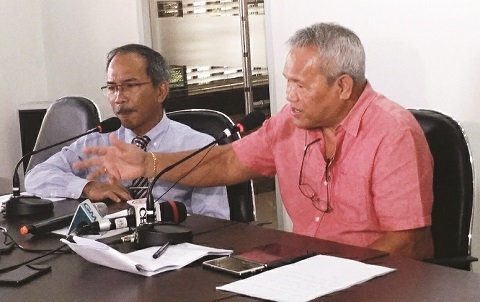 In its latest decision, the ombudsman’s office dismissed the case that nearly cost Moreno the mayoral post a few months before the 2016 elections because the vice mayor then, Caesar Ian Acenas, invoked the rule on automatic succession as he attempted a city hall takeover, citing an ombudsman’s order to dismiss Moreno and bar him from public office for life. The appellate court ended the standoff at city hall with a status quo ante order or an order to revert to the state of affairs at city hall before Acenas asserted that he already assumed as mayor. The January resolution was signed by assistant special prosecutor Anthony Ludalvi Vista, Assistant Ombudsman Pilarita Lapitan and Ombudsman Samuel Martires. “Justice always prevails,” said Moreno even as he thanked his legal defense team headed by lawyer Dale Bryan Mordeno. Moreno said the decision of the Office of the Ombudsman-Manila only showed that the case was merely used by his political opponents for black propaganda purposes and to subject him to political harassment. The 12-page decision sprang from Moreno’s move to assail the Feb. 23, 2016 ruling of the Mindanao office of the Ombudsman in Davao. He asked the Office of the Ombudsman in Manila to review the case. During the review, the Office of the Ombudsman-Manila agreed with Moreno’s argument that the city hall-Ajinomoto agreement no longer needed the approval of the city council because it was an exercise of the function of the city treasurer based on the Local Government Code. Ombudsman Martires’s office “modified” the February 2016 decision and dismissed the case. The 2014 city hall-Ajinomoto settlement, sanctioned by a regional court, lowered the company’s accumulated tax obligations to the local government from P2.9 million to some P300 thousand. The out-of-court settlement came after Ajinomoto filed a case to question the formula used by then-treasurer Bañez in computing its taxes. For years, Ajinomoto’s food additive product was classified as “essential.” When Bañez took over as city treasurer, the product was reclassified as “non-essential,” changing the formula used by city hall in computing Ajinomoto’s taxes. The 2014 city hall-Ajinomoto agreement allowed the food additive to be classified as “essential” again, thus, allowing adjustments in the company’s tax obligations. Mordeno, the mayor’s lawyer, said the local chief executive no longer has any case pertaining to the city hall-Ajinomoto tax settlement. Mordeno said the administrative aspect of the Ajinomoto case was already thrown out by the Court of Appeals in 2017, a claim that the mayor’s accuser, William Guialani, questioned. The former Taglimao barangay chairman challenged Mordeno to show proof that the administrative case was already dismissed. “Yes, the criminal case was dismissed in favor of Moreno, but there is still an administrative case which is still pending in the Supreme Court,” claimed Guialani, adding he was still hopeful that the High Tribunal would rule in his favor.